The first time Jim put a harness on Shaman and put him in front of the cart, Shaman put his head down and pulled with perfect form. All four feet stayed on the ground and he came fast, tail a wagging the whole way. He was a natural, as the weights got higher he came faster! Shamans first season pulling Jim stopped him a lot because Shaman was too young to get his hips checked. He was pulling over 26% (times his body weight) on wheels with fast times. Snow was his favorite surface. Jim and Shaman never had enough snow to train at home, so his training was the sanctioned pulls in Washington State. 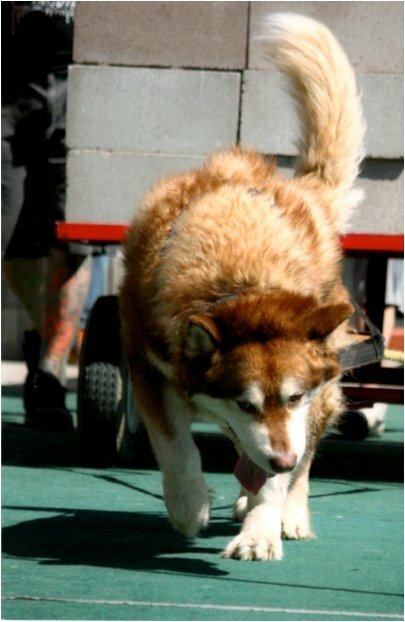 Shaman had a little bit of all the Championships of Cascade Kennels in his blood line. Jim believes that's what made him a natural puller. Shaman was a sweet, laid back, easy going dog at home but the minute Jim and Shaman entered the holding area and the pulling chute Shaman fired himself up so he could do his best! Jim always told himself, if we entered the chute and Shaman was not like that, Shaman was telling Jim he was done and they would walk away. Jim is proud to say that at the end of Shaman's eight pulling seasons, Shamans last Championship trip in Canada, Shaman still had the fire! Shaman ended his career with a total of 16 Regional Medals, 14 were Gold and 2 were Bronze. Shaman had 10 Championship Medals, 3 were Gold, 2 were Silver and 5 were Bronze. Jim says it has been an honor to have been in the company of some of the great dogs of the times; Terry Reeds King Dukes, Stephanie Pitz' MJ, the Ferraris Avalanche, Icy and Stormie and the Sellers Badger and Teton. The IWPA Board of Directors reviewed the application and unanimously voted to induct Shaman into the International Hall of Fame.